A small/medium sized purse from Amy's house. It has two Max Restores, two Revives and two Full Heals. It also has an ever stone in it. Pokédex Entry It spins its two tails like a screw to propel itself through water. The tails also slice clinging seaweed. Miles was the only one born to a single-mother Floatzel, and he was only there for a short time of his life. 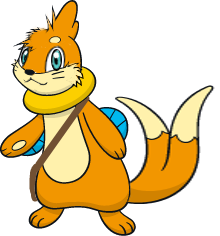 Since the time he was young, other species called him Tails because he was the only Buizel they've ever seen. Soon, he had been caught by a human, a human who called herself Amy. She let him roam around the house, not worried he would escape. Tails went to the wooded part of the yard with a whole bunch of brush, then he saw a blur run by. He stared for a minute, then put on a huge grin out of curiosity. He ran after the blue blur, who was really darn fast. Finally, he caught up at the edge of the trees. The small blue dog was looking at the house through the barb wire fence. Tails walked up. Tails asked who he was and how he could run so fast. The Riolu looked back at him and gave him a thumbs up. He said he was Sonic, Sonic the Riolu. Tails grinned and introduced himself. He said his name was Miles, but everybody calls him "Tails." Sonic grinned and asked if Tails was one of Amy's pokemon. Tails nodded at him. Sonic went on to tell him all about Amy's ways and how she was a major annoyance and stuff. Tails agreed that he wouldn't get involved with that. As their first few days went on, Sonic told him all about the goings on around the town. Their neighbor was an evil scientist who wanted to take over the world, and Sonic wanted to stop him. Tails energetically said that being a scientist sounded cool and he wanted to be one too. Sonic said that the doctor's name was Robotnik who liked to use these ridiculous contraptions to hurt other pokemon. And he had a nephew named Snivley and he had acquaintance villains like the Iron Queen. Tails agreed he'd help Sonic stop him and his acquaintances. One day, Sonic wanted to finally show him something. They went out into the yard, and Sonic pulled on a vine, raising up the top of a stump like a lid. He jumped in, and Tails reluctantly followed. They went down the tunnel and Sonic walked into an underground room. There were others there, and they greeted Sonic happily. Sonic introduced Tails to them. There was Sally the shiny Pikachu and Bunnie the Buneary, Rotor the Spheal and Antoine the Patrat, Knuckles the Combusken, and Sonic's siblings, Manic and Sonia the Riolu. They all took to Tails quickly, and Rotor took up his offer to be a "scientist" and join in on his "projects" he's building. Tails happily accepted. They made gizmo's and whatchamacallit's and seemingly useless stuff but not to them. Sally seemed to be the leader of the entire group, all against "Eggman." They planned their first attack. It was a success, taking out Nick's lawn mower deemed the "Egg-mower." Nick got mad at them and shooed them away and threw stuff at then. Sonic yelled that they'd be back. Tails found this a lot of fun, even if it was hard to thwart his plans. Sonic said he's a great addition to the Freedom Fighters. They went back to their hide out, which they called Knothole. Soon, they all dispersed home. Amy was glad to see them, and Sonic got a whole bunch of attention like he said Amy does, and Tails awkwardly grinned. They settled in, their day was done. One time, Sonic had tried to steal some of the pokemon treats from the cabinet in the kitchen. Amy saw him, and angrily threw a rubber squeaky hammer at him. He was scolded and put in time out. Tails decided he wouldn't mess around with Amy if he could help it. One morning, they were out with the group and doing their usual thing, when something started to boom in the trees above ground. They thought it was Nick cutting down the trees like usual, but then they went to check it out. There was a large (undead) pokemon there, stomping around in the trees. All of them ran, going back home. Sonic told Tails to run, and Tails made for the house. He looked back quick enough to see Sonic running after him. They made it into the house, and Amy wasn't there. Sonic told Tails he'd hold off the pokemon enough so Tails could escape. Tails, guiltily, fled. And he hadn't seen Sonic since, but he knew Sonic would be ok. Tails was now on his own, far away from home. 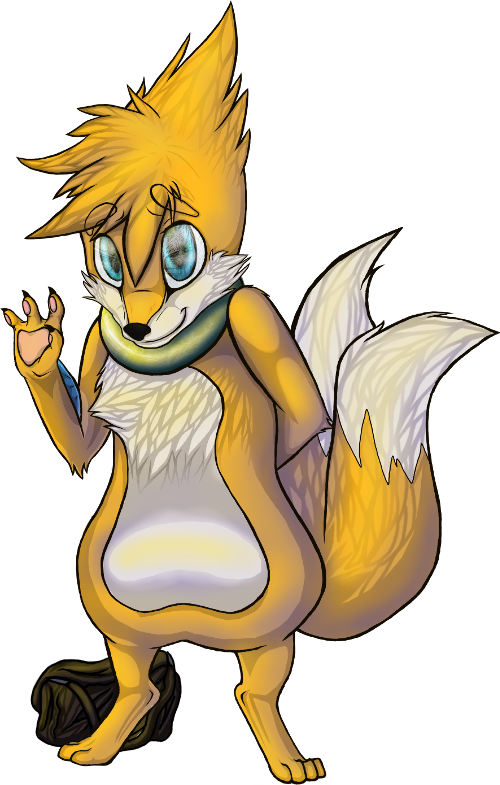 He's a normal Buizel, smaller because he's young. His head fur is a bit ruffled and wild, and the back hair sticks up kinda spikey and a bit forward. His tails are kinda large because he's small, and more full than wispy. His eyes are bright, sky and turquoise blue, and his whiskers are kind of thin. His cheeks are furry and are the color of his muzzle. He is usually happy, and he's curious about a lot of things. He particularly enjoys studying anything that looks like or is a machine, and wants to know how to build and use machines some day; although realistically he couldn't. He tends to stay very hopeful and not so much doubtful in tough situations. He puts faith into things like he used to do with Sonic, and he doesn't really realize things may not end up alright. However, he has little faith in himself, relying on Sonic a lot as a partner. He still thinks Sonic is alive. Tails very much used to idolize Sonic, following him around and wanting to be just like Sonic. But he never really believed in himself enough to think he was just as cool as his friend, as many times as Sonic told him that he was. Tails helps out in whatever ways he can, even if he's physically weak. He likes using special moves such as Swift more than his physical moves. He carries a bag which has two Max Restores, two Revives and two Full Heals, but uses them very sparingly. He always tells the truth, and he's very innocent in his actions. He never intends to hurt or upset anyone and he only wants to be the best for everyone. It also makes him a bit oblivious to sneaky bad creatures. Since he and Sonic used to play hero and sidekick, he has a bit of an active imagination. He doesn't want anyone hurt or killed, and he'll try to talk others out of killing things if it's not necessary. He doesn't rely on himself, and he usually relies on others to help him through his life. He doubts himself and doesn't trust himself enough to be able to do things on his own, even when he can. He tries to put faith in himself, for Sonic. He's able to do great things, but he's to scared to at times. He takes compliments very seriously, and he gets really happy if someone compliments him. He doesn't believe he's smart and mostly what he wants is to belong again like he did before. User Notes •I used the American and Japanese continuities. I used SATAM/Archie, Underground (because Manic and Sonia), and Sonic Adventure. •The bag is only the size of a small/medium purse. •Tails can only hover for about five seconds, and not.very steadily. It's more of a cute little skill he likes to practice. •The neighbor, in reality, was named Nick. A large man who used to use a lot of tools and outdoor appliances. They only thought they were terrible machines because of their imaginations and childish ideas. •Sonic is still alive, but Amy had been killed in the back room. They failed to notice the house was a wreck in their panic, and they didn't check any of the rooms.